The amount of hay cuttings in a given season depends on a number of things – rain, heat, geography. Farmers and animal lovers have been arguing for years about whether there is much of a difference between first and second cut (or even third or fourth cut, not often available up here), and I have my own opinions about it, having been buying, tasting and observing animals and their health and diet for more than a decade. First cut is generally the first time hay is cut, it starts growing in the field in the Spring. Farmers mow (cut) the hay down as the hot and dry weather of the summer comes. The green cut hay is permitted to dry out in the fields and under a warming sun and is then baled – either in smaller, square bales or the much bigger round bales – and transported and sold. Cows invariably get round bales of first cut, left out in the elements. Cows are not fussy about what they eat. They are generally given grain as well. First cut hay is grass heavy and doesn’t have a lot of legumes, such as alfalfa or cover. In late July or August, weather permitting, this second stand (a/k/a second cut) is harvested, dried and baled. Usually, second cutting is a lighter harvest that yields fewer bales than first cut, when the grass is going sort of wild, given rain and sun in the right mix. Second cut smells sweeter and is richer in nutrients. Also calories. First cut hay is coarser than second cut, this is because the spring growth (rain, etc.) leads to thicker stems and stalks and heavier leaves. Second cut hay has a finer texture and usually, a greener color and heavier leaves. It is more dense, the leaves are more tender and healthier, especially in protein. It is also somewhat more expensive, anywhere between 50 cents and a dollar a bale, depending on where it is grown. Donkeys and sheep are generally fed first cut, they are hardy and adaptable, they will eat almost anything green, second cut hay is a luxury for them, sort of like Thanksgiving Dinner. If you have a horse or pony like Chloe, you have to limit the amount of green grass, and especially, second cut hay. Equines can founder – a serious and painful wasting disease – or gain too much weight, or eat too much sugar, prevalent in rich green grass in the Spring. At first, like many newcomers to farms and animals, I (I dislike the term “gentleman farmer,” as there is nothing inherently privileged or well-mannered about someone just because they own a farm as a second home) fed all of my animals second cut hay all winter until shocked farmers straightened me out. “It isn’t Thanksgiving every day,” they said, almost every one of them. Generally, we feed all of our animals first cut and in limited amounts. Our animals – 10 sheep, two donkeys, one pony – generally are fed about a bale of hay a day altogether, or a bit less – one-third around 8 a.m., one-third around 3 p.m. They share the feeders, moving back and forth from one to the other. Generally, the equines end up eating in one feeder, the sheep in another. 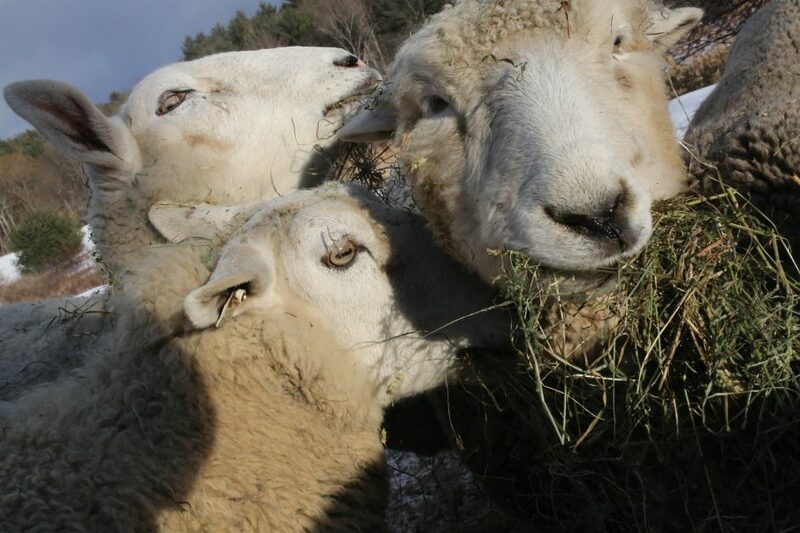 The equines eat much more deliberately and chew much more thoroughly than the sheep, who grind the grass with their back teeth and nearly inhale it. In mid-winter, when there is a strong wind or heavy snow or single digits, we break out the second cut, it is believed to give them more energy and strength to ward off the cold. We also have heated water at all times in cold weather, the water itself warms the animals and they drink a lot of it when it is cold. This year, we purchased 120 square bales of first cut, 20 bales of second cut. They hay cost between $4.50 and $5.50 a bale. I am not an animal nutritionist, but I notice a marked change in the way animals eat first or second cut. Second cut clearly smells better and tastes better for them, they devour it, they practically climb all over one another, as you can see above. First cut is eaten in a much calmer, quieter way. When we are putting second cut hay out, I hold Red back, the sheep will uncharacteristically pay little mind to him, or to us. That’s how I know it is different. They just gobble it down. We are feeding second cut today and tomorrow, it’s supposed to be especially cold, and then warm up on Tuesday a bit. Back to first cut. I took some photos today which show how much the sheep love second cut hay. I hope they enjoy it, it isn’t Thanksgiving every day.